First Minister, Nicola Sturgeon, has pulled out of an Edinburgh conference after learning that former Trump strategist, Steve Bannon, has been invited to speak. Bannon, a former White House adviser whose far right political views have been widely condemned, is listed as a speaker at an event in Edinburgh called News Xchange 2018. Sturgeon was due to open the conference at a reception at the National Museum of Scotland on 13 November 2018, the evening before Bannon is scheduled to speak in the Edinburgh International Conference Centre. BBC Scotland is described as “co-hosting the event.” The agenda includes a special edition of BBC Question Time, with the BBC’s Sarah Smith lined up to interview Bannon. A BBC member of staff, Chris Gibson, is also named on the agenda as executive producer of the conference. After The Ferret broke the story, Sturgeon tweeted that she “passionately” believed in free speech, but that as a government leader she had to make balanced judgements. “I will not be part of any process that risks legitimising or normalising far right, racist views,” she said. In a second tweet she strongly criticised the BBC. “The email the BBC sent to my office justifying Bannon’s inclusion described him as a ‘powerful and influential figure…promoting an anti-elite movement’,” she said. The email the BBC sent to my office justifying Bannon’s inclusion described him as a ‘powerful and influential figure…promoting an anti-elite movement.’ This kind of language to describe views that many would describe as fascist does seem to me to run the risk of normalisation. Sturgeon is not the only participant to withdraw from the event after organisers announced Bannon’s involvement. Ash Sarkar, of Novaramedia, was due to be a participant on the special Question Time panel. She said she would withdraw from the event. “If @NewsXchange are committed to platforming Steve Bannon, then I withdraw from participating in either of my panels at this conference,” she said. This is the first I’ve heard of this. If @NewsXchange are committed to platforming Steve Bannon, then I withdraw from participating in either of my panels at this conference. Since leaving the White House Bannon has visited Europe, offering support to far right parties such as France’s National Front, Alternative for Germany, Austria’s Freedom Party and the Italian League. In March, Bannon defiantly told a far right crowd in France, “Let them call you racist,” but he has denied being a white supremacist. In August, he praised Boris Johnson and far right figure Stephen Yaxley-Lennon, aka Tommy Robinson, in the same interview. The rightwing populist from the US said he admired Johnson and that the former foreign secretary had “nothing to apologise for” after a controversial comments he made over Muslim women wearing full veils. Yaxley-Lennon co-founded a violent anti-Islam group called the English Defence League. He is a convicted criminal with a history of violence who now refers to himself as a “journalist”. The agenda for News Exchange 2018 says Bannon is scheduled to speak at the conference in a major slot on 14 November. He is described as a “political strategist” and is due to talk from 11.25am to 11.45am. His talk will be followed by an interview with the BBC’s Sarah Smith and a question and answer session. Other speakers at the event include Tony Hall, director general of the BBC. News Xchange’s website says: “We are a two-day, annual conference focusing on bright ideas, opportunities and challenges for the international news industry. “We bring together 600 plus executives, journalists, presenters, bloggers and start-up entrepreneurs from all around the world to share, learn and cross-pollinate ideas with an array of experts, scientists, artists and thought leaders. Tickets for the event start at €300 and rise to €1,695, and it has been organised by the European Broadcasting Union (EBU). 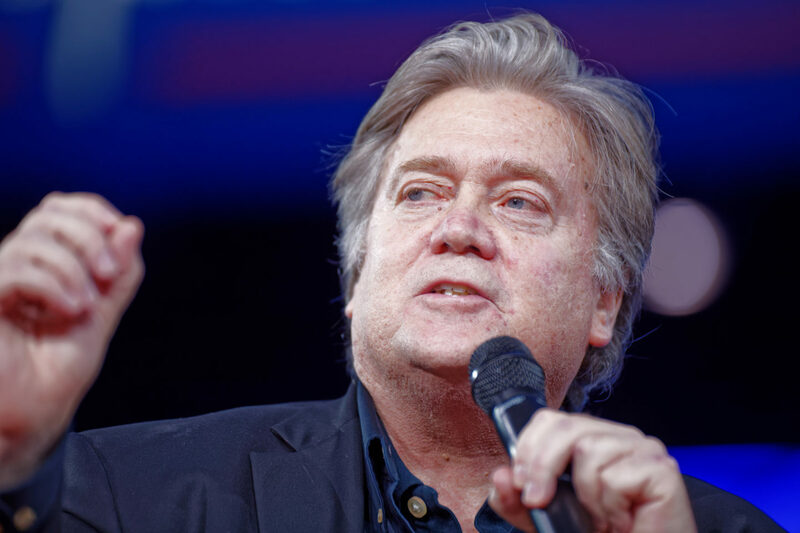 Patrick Harvie MSP, of the Scottish Greens, said: “Steve Bannon has been centrally involved in the attempt to re-boot the far right, both in the US and in Europe. “To normalise such dangerous extremists and give them media platforms of this kind only serves to give them a veneer of legitimacy. Unite Against Fascism said: “Steve Bannon should not be speaking at this conference. He is not a normal strategist, his stated aim is to build a European wide movement of the far right. “This is not about freedom of speech. Bannon edited a website which carried the most horrific antisemitic articles. “Allowing Bannon to speak will not undermine him, instead giving him a platform like this increases his credibility. A spokesperson for the event organisers, EBU, said: “News Xchange is a journalism conference which seeks to explore the main industry trends and challenges delegates to understand the wider political and social context. “Steve Bannon is a key influencer in the rise of populism – one of the dominant political trends of our times. He has been invited to speak at News Xchange this year because his views are relevant to today’s society at large and therefore to the media industry. The BBC also issued a statement in response to The Ferret’s story. “News Xchange is an annual EBU journalism conference which the BBC and other broadcasters support to make happen,” it said. This article was updated at 13.52 on 20 October 2018 to add a comment from Unite Against Fascism, and at 18.05 to include a statement from the BBC and comments by Nicola Sturgeon.